Hey Newbie! Great to hear you are into the RV scene. It’s a fun and exciting time to jump in and head out. Let’s not let anything stand in your way though as you are about to have the time of your life. Check out what self-proclaimed “Professional Newbies” Tricia and Marc have to say before you leave the driveway. They went ahead and made just about every mistake possible,….. just so you don’t have to! You really don’t need as much as you think you do. “The desire to make it so” – this is how we landed on the moon, and this is also how you will get yourself moving in the direction towards you first big camping adventure should you so choose to. What tools are actually essential? Not much, and you should have most of them already. Marc shares 1 tool that you won’t get with your trailer that is actually essential to have, but doesn’t come with your new trailer. You need Tires! Not just any tires, the right ones for what you are planning to do with your new travel trailer. If you are just going to a few local spots a few times a year, then most likely the tires on it are just fine. But what if you are going state-to-state and 10,000 miles a year? Different tires. They are called accidents for a reason. But that doesn’t mean that you have to make all of them to learn from them. You’ll be much better off if you try and learn from the mistakes of others, so you can go ahead and start making your own. How many times do you need to hear that Communication is the Key to success. Even successful trailer hauling and parking. Go ahead and talk about what is going to happen, when it’s going to happen, and who is in charge of each thing happening. You’ll thank Tricia later for this. Measurements for a lot of things in this life are important to know. Let me ask you; what is you waistline measurement? You know knew it before I got to the end of that sentence. You won’t be looking at your trailer height in the mirror from the front, from the side, and then back from the front too often. But it’s a good idea to know it to avoid any ensuing heart attacks when the bridge clearance sign shows up and you have to decide from slamming on the brakes or possibly loosing your favorite air-conditioner. 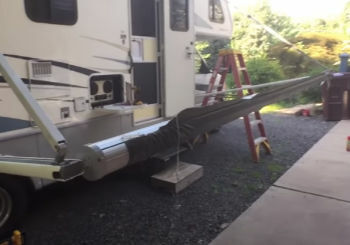 What the @%$% is Boondocking? It’s actually camping out in the wilderness. Period. Ok – not end of story. This is what camping started out as a long long time ago. Before power hookups, sewer, and even free wifi. Your trailer and the humans living in it have water going in and waste going out. Your trailer is going to need to take a leak when it’s full too. Planning, sschmanning. You told me in tip #1 to get the keys and go. Now I need to plan? Oh bother..
Ok, not too much planning. But a little is helpful. You do like to have toilet paper handy when you need it right? 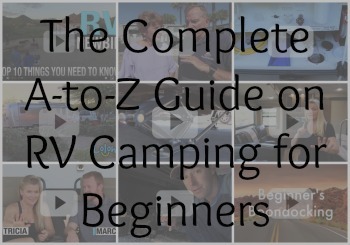 Watch this video below before you head out and see the full 10 video series on RV Camping for Beginners here. RV Newbie?? Top 10 Things you NEED to know.